The best pestos you don’t buy but make yourself. While it’s usually basil, olive oil, pine nuts, garlic and Parmesan cheese you blend together as a green pesto, this favourite in our household is a red pesto. We always try to have at least a jar (or two) on stock.. It’s delicious as spread on bread or a cracker, (optional) with ripe avocado & sea salt on top. Or you use it in a pasta, for example with chilli, garlic and prawns. We sometimes make puff pastry rolls, with this pesto being the base and we add some Parmaham, Parmesan cheese or fresh basil to it. 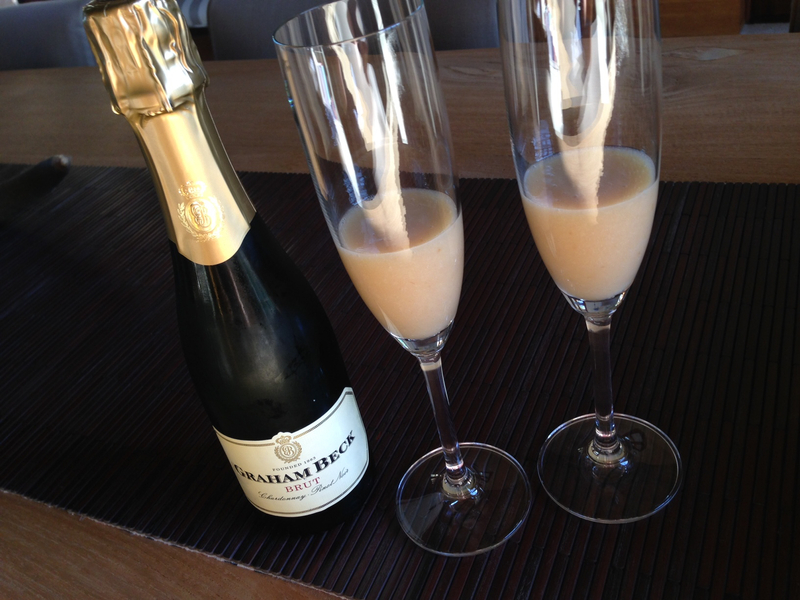 A very simple sundowner snack, and soon on the blog! 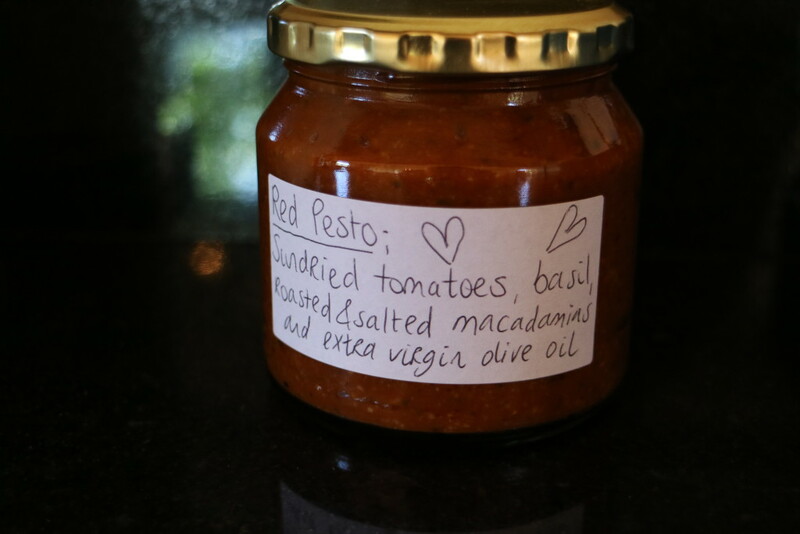 This sundried tomato & macadamia nut red pesto is a recipe from my brother who was nice enough to share it with me. And today I will share it with you! Cut the shallots into your kitchen blender fine. If you don’t have one, cut the shallots fine by hand and place in a mortar. Do the same for both the basil and the sundried tomatoes. Mix all together. Squeeze and crack the salted macadamia nuts in a mortar, doesn’t have to be powder, just a bit crushed is enough. 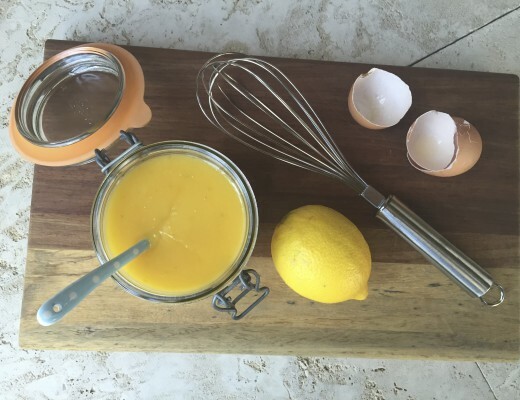 Also add the lemon juice (not too much!) or wine vinegar, and then the tomato, shallots and basil-mixture. Now it’s all about mixing the ingredients until they become a nice tapenade style pesto. If you do it by hand with the mortar it will take you a bit longer than with a kitchen blender. Add olive oil to taste and to substance, if it’s too dry add a bit more and when it’s too oily try to add more of the dry ingredients as nuts or basil. The pesto must be like a spread or tapenade. Taste and season if necessary. Salt won’t be necessary if you use salted macadamia nuts. A little bit of black pepper or cayenne pepper can be nice to finish off. You can use sterilised jars to keep your pesto up to 3 weeks in the fridge. 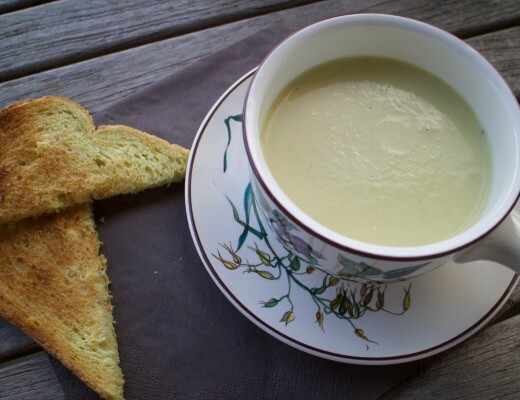 If you find that the pesto turns brown or green soon add a thin layer of olive oil to the top. 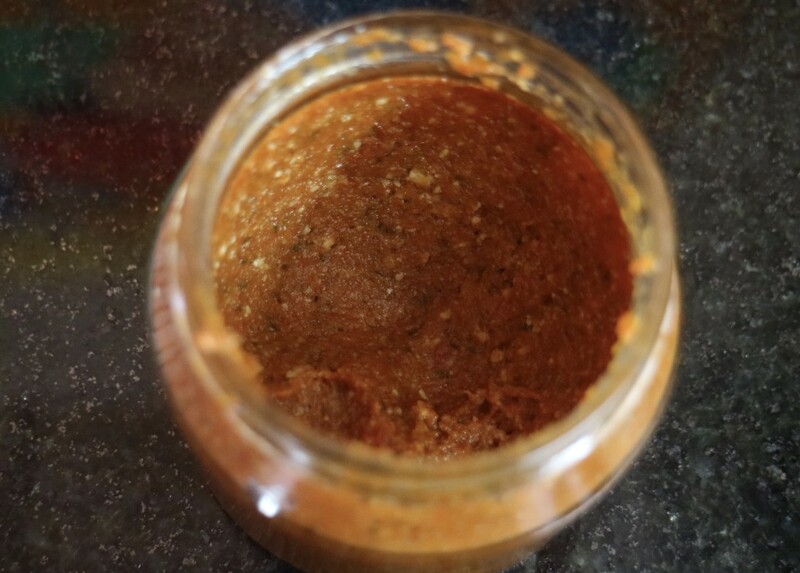 I promise you: this is a delicious red pesto to eat ‘as it is’ on farm style bread or a cracker, but you can also make small dishes with it, for example with mozzarella or chicken fillet. If you want to make a pesto-pasta make sure there is slightly more oil add to the mixture. It’s nice with a prawn-garlic-chili pasta, or together with chicken fillet and courgette. Soon I will share the ‘wine o’ clock’-puff pastry rolls on the blog, prepared with this pesto.